It's rather shocking to me that I have not yet blogged about chocolate cake. My family is all about your standard chocolate layer cake. Sure other cakes are good, but if it's your birthday? Chocolate layer cake. If I ask what they want me to make? Chocolate layer cake. If I had to limit myself to one kind of cake for the rest of my days (God forbid!!!)? Chocolate layer cake. And the recipe we use is one of the easiest out there. 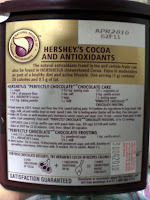 To find it, just buy a box of Hershey's Cocoa Powder (Unsweetened). The recipe is on the back. You really can't go wrong. 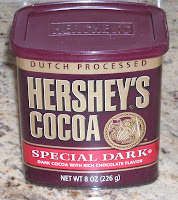 Except for this time I kind of did...I bought dark chocolate cocoa powder, instead of the normal semi-sweet. Now, dark chocolate sounds like it cannot possibly be a bad thing (and I'm not saying that there is anything bad about this cake) but it's just not quite the same as my go-to chocolate layer cake. It's denser. If you make the semi-sweet recipe, the cake is lighter, and you can cut the layers in half to make a truly spectacular 4-layer cake. ONE-PAN CAKE: Grease and flour 13×9x2-inch baking pan. Heat oven to 350° F. Pour batter into prepared pan. Bake 35 to 40 minutes. Cool completely. Frost.